After two months of living in Cape Coast, I finally decided to tour the castle this afternoon. 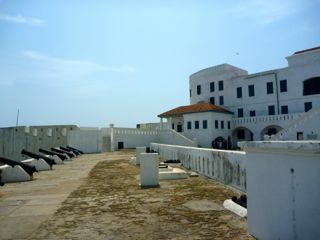 Originally built by Swedish traders for the exportation of timber and gold, Cape Coast Castle eventually became the main British hub of transatlantic slave trade in West Africa. After some time spent perusing the museum, we were met by our tour guide at the entrance to the chambers. As we made our way into the small underground slave chambers, our tour guide turned off the light. We stood there for several minutes in the damp darkness, the only source of light coming from a small opening at the top of the wall. Our tour guide explained to us how over 200 men were forced to live in this 30×15 foot cell. They would live, sleep, eat and do their daily-deeds there… all 200 of them in this tiny dark space. They would spend their days in this chamber until it was time to pass through “The Door of No Return.” From this door, they were sent by small boats over to a larger boat known as a “floating coffin.” People were stacked in this boat like bags of rice, given no space to move. Many people died while in captivity at the castle, others died during their trip overseas. If they managed to survive until their destination, they were taken to the auction block and sold. If any slave chose to challenge the authorities, they were sent to a confinement cell. Once they were sent to this tiny dark room, they were left to die. They were deprived of food, water and oxygen. You can still see scratch marks on the walls, left by the men as they suffocated. There was a similar cell for the female slaves who refused to let themselves be raped by the slave-trade workers. In 1807 there were movements in the US and Britain to abolish the slave trade, but it took until the 1860’s before it actually stopped. 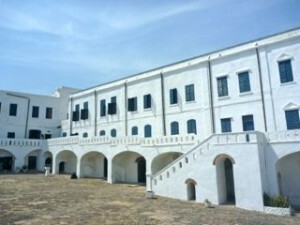 The castle came under the the care of the Ghana Museum and Monuments board in 1957, after independence. It was restored in the 1990’s, and now stands as one of the primary tourist sites in Ghana.